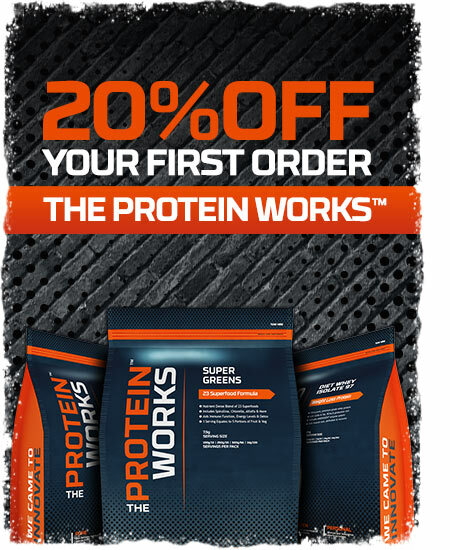 Welcome to THE PROTEIN WORKS™, the UK's most innovative sports nutrition brand. Each and every day, we challenge the norm to bring you PURE, PROVEN and PERSONAL products that re-define sports nutrition. We are proud to be rated the number one sports nutrition brand on Trust Pilot. In fact, we guarantee you won't find better anywhere in Europe, or your money back! Whether you are looking for a great tasting protein shake, protein powder , pre workout or one of our infamous protein snacks, we've got everything you could possibly need to achieve your goals. Our Quick-Start feature is designed to lend a helping hand when choosing the right products for your specific goal and profile. Just tell us your goals using the link below and we'll provide you the products recommended personally for you. To make giving us a go a total no-brainer, we're giving you a massive 20% OFF across our entire range. Just surf the site, take your pick and enter the code below in the promotion code box.